There was a time when every third Kickstarter campaign was for smart luggage, but when some airlines banned cases without removable lithium batteries and other electronics, these died a death, as well as more established companies like Bluesmart. However, there are still some clever solutions to help you travel well, from those with hidden removable chargers and scales to those with built-in organisers and even a digital travel assistant. We’ve rounded up our favourites to help you make a smart choice. This case may look like it’s escaped from Tron, but its unusual looks means it can go anywhere. The futuristic design incorporates GravityRoll Wheel Technology, which the firm claims lets users roll its case with ease over any terrain, including snow and even down steps. It’s not the lightest luggage out there, but it also includes a ‘G-RO power bank’ so you can charge your phone on the go. Made with durable materials and with a lifetime guarantee, it might be a good option for adventurers whose days of lugging heavy backpacks and staying in hostels are behind them. The thought of your mobile running flat at the airport can be nerve-wracking if you use e-tickets or are travelling to somewhere new where you need GPS. 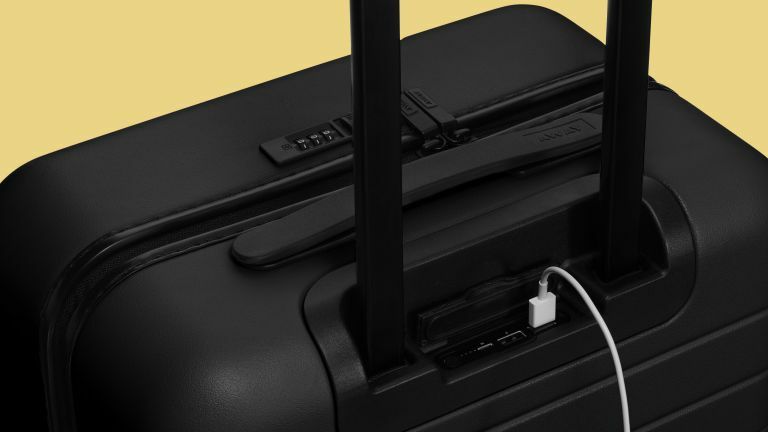 Away’s range of suitcases aim to solve this problem, thanks to their built-in batteries, which are ejectable to conform to new airline policies. Users can plug their phone, e-reader and other gadgets into the ports built in to the module. The case comes in a choice of sizes, but all have an unbreakable polycarbonate shell, TSA-approved combination lock and 360-degree swivelling wheels. For your inner neat freak there’s a hidden laundry bag and an interior compression system, which is handy if you like to shop on holiday. And best of all, there is an amazing choice of colours to make your bag stand out from the rest on the luggage carousel. Horizn’s cases are claimed to the world’s first to come with a personal travel assistant, meaning there’s a free 12-month trial of the brand’s Horizn GO service, which promises to act like a virtual travel agent, booking flights and hotels for user, as well as suggesting trips tailored to a user's preferences and exclusive benefits. But perhaps of more practical benefit is that all the cases come with a removable battery so you can charge your phone at the airport, 360° spinner wheels to ensure you roll on through the departures lounge smoothly and a tough polycarbonate shell to keep your belongings intact. Marketed at frequent fliers, the Berlin-based brand’s M5 cabin luggage model has a front pocket made from Italian leather and waterproof nylon and has enough space to hold a 15-inch laptop. If you’re fed up of running for your gate at the airport then why not consider the Modobag? Instead of lugging a case around, this one will carry you, because the sit-and-ride motorised luggage can help speed you through the airport terminal at a top speed of 8mph. There are telescopic handlebars so you can steer, and it can travel up to six miles on a single charge, which is handy in the event of a delay when you can do laps of the Duty Free. It comes with dual USB charging points to make sure your phone is ready to go too. The drawbacks? It weighs 20lbs with nothing in it and if you’re a fan of having a relaxing tipple at the airport, you probably shouldn’t drink and drive! If you're big on shopping and stress about your baggage allowance on the way home, this case might be for you. Samsonite's Pixon range has a built-in scales so you can always make sure you're within the weight allowance and don't get suckered for extra fees at the check-in desk. The idea is that you can fill their case (to bursting point if you must) then look at the scales next to the handle to put your mind at rest, or help you think again about your packing choices. The case's boxy shape maximises volume, while puts 'pixel' dot design on the shell helps it stay looking sleek and minimises the appearance of scratches.